Place Vendôme is a square in the 1st arrondissement of Paris, France, located to the north of the Tuileries Gardens and east of the Église de la Madeleine. It is the starting point of the Rue de la Paix. 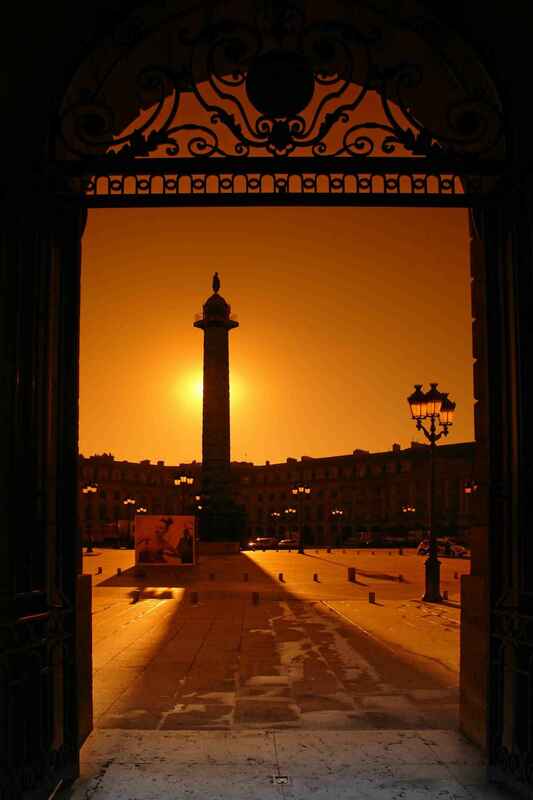 Its regular architecture by Jules Hardouin-Mansart and pedimented screens canted across the corners give the rectangular Place Vendôme the aspect of an octagon. The original Vendôme Column at the centre of the square was erected by Napoleon I to commemorate the Battle of Austerlitz; it was torn down on 16 May 1871, by decree of the Paris Commune, but subsequently re-erected and remains a prominent feature on the square today. The original column was started in 1806 at Napoleon's direction and completed in 1810. 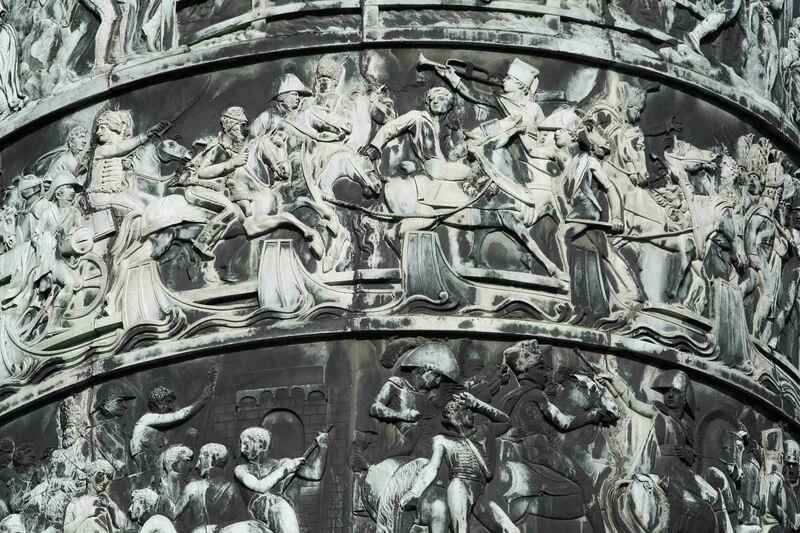 It was modelled after Trajan's Column, to celebrate the victory of Austerlitz; its veneer of 425 spiralling bas-relief bronze plates was made out of cannon taken from the combined armies of Europe, according to his propaganda These plates were designed by the sculptor Pierre-Nolasque Bergeret and executed by a team of sculptors including Jean-Joseph Foucou, Louis-Simon Boizot, François Joseph Bosio, Lorenzo Bartolini, Claude Ramey, François Rude, Corbet, Clodion and Henri-Joseph Ruxthiel. A statue of Napoleon, bare-headed, crowned with laurels and holding a sword in his right hand and a globe surmounted with a statue of Victory (as in Napoleon as Mars the Peacemaker) in his left hand, was placed atop the column. In 1816, taking advantage of the Allied occupying force, a mob of men and horses had attached a cable to the neck of the statue of Napoleon atop the column, but it had refused to budge – one woman quipped "If the Emperor is as solid on his throne as this statue is on its column, he's nowhere near descending the throne". After the Bourbon Restoration the statue, though not the column, was pulled down and melted down to provide the bronze for the recast equestrian statue of Henry IV on the Pont Neuf (as was bronze from sculptures on the Column of the Grande Armée at Boulogne-sur-Mer), though the statuette of Victory is still to be seen in the salon Napoléon of the Hôtel des Monnaies (which also contains a model of the column and a likeness of Napoleon's face copied from his death mask). A replacement statue of Napoléon in modern dress (a tricorn hat, boots and a redingote), however, was erected by Louis-Philippe, and a better, more augustly classicizing one by Louis-Napoléon (later Napoléon III). His project as proposed was not adopted, though on 12 April 1871 legislation was passed authorizing the dismantling of the imperial symbol. When the column was taken down on 16 May its bronze plates were preserved. After the suppression of the Paris Commune by Adolphe Thiers, the decision was made to rebuild the column with the statue of Napoléon restored at its apex. For his role in the Commune, Courbet was condemned to pay the costs of rebuilding the monument, estimated at 323,000 francs, in yearly installments of 10,000 francs. Unable to pay, Courbet went into self-imposed exile in Switzerland, the French government seized and sold the artist's paintings for a minor amount, and Courbet died in exile in December 1877. In 1874, the column was re-erected at the center of Place Vendôme with a copy of the original statue on top. An inner staircase leading to the top is no longer open to the public. Place Vendôme | eTips Inc.